I’m Adding To The CthulhuWho1 Flickr Collections! My CthulhuWho1 Flickr Collections have been neglected while I’ve been spending so much time here in the CthulhuWho1 Blog doing readings and other things; so I’m going to take a break from doing readings, so I can spend some time adding more photos and scans to the Flickr Collections, with updates of the activities being posted here. I’m a very large guy, but it’s still hard to be in two places at the same time; so don’t get jealous of my non-blog activities. This entry was posted in Flickr Lovecraft Updates, Flickr Updates and tagged Flickr, Flickr Updates. Bookmark the permalink. 3 Responses to I’m Adding To The CthulhuWho1 Flickr Collections! Your photo galleries are an invaluable asset to Lovecraftian history. I’m looking forward to whatever’s next! 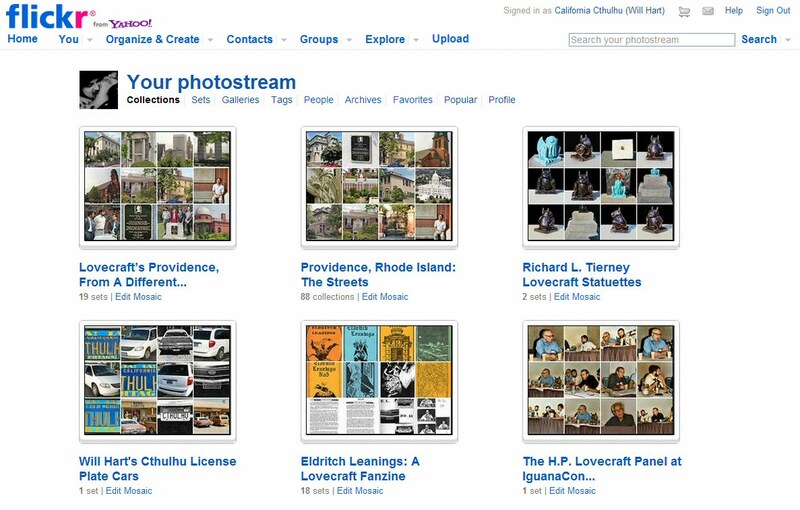 Thank You for finding the Flickr Collections of value! I’ve done all the work of getting them out there, because of my belief that I should share them with everyone; but I only receive feedback about once for every 725 clicks on the photos. I have plans for many more additions to the Flickr Collections, so watch your email for updates; yes, this means I’ve added you to my email list. I’ve got a couple of tasks to complete over the next few days (somewhat Lovecraft related), and then I’ll get back to the planned Flickr updates, starting with some very interesting items from E. Hoffmann Price. Will, what you are doing is amazing. Keep blogging !